Scott Anthony Fujita (/fuːˈdʒiːtə/; born April 28, 1979) is a former American football linebacker in the National Football League (NFL). He was drafted by the Kansas City Chiefs in the fifth round of the 2002 NFL Draft. He played 11 seasons for the Chiefs, Dallas Cowboys, New Orleans Saints and Cleveland Browns. He was a member of the 2009 Saints team that won Super Bowl XLIV, defeating the Indianapolis Colts. He played college football at California. Despite having a Japanese last name, Fujita is not biologically Japanese. He was adopted as an infant by Rodney Fujita, who is a third-generation Japanese-American, and his wife Helen, who is white. Rodney was born at the Gila River War Relocation Center in Phoenix, Arizona where his father Nagao, a 442nd Infantry Regiment combat veteran who later became an attorney, was one of many Japanese-Americans whose family was interned during World War II. Fujita grew up in a traditional Japanese household, celebrating Japanese festivals and holidays, and eating with chopsticks. His grandparents have several bonsai trees on their property. He attended Rio Mesa High School in Oxnard, California. Fujita was selected in the fifth round (143th) of the 2002 NFL Draft by the Kansas City Chiefs and became a starter midway his rookie season. The next year he started all 16 games an led the team with 151 tackles (fifth most in club history), while also recording 4 sacks, 6 passes defensed, one forced fumble and one interception. In 2004, although he led the team with 112 tackles, he is best remembered for a devastating hit to LaDainian Tomlinson near the sideline of a Kansas City / San Diego contest. After the hit, Fujita recovered the ball before it went out of bounds and proved to be a turning point in the game. In 2005, After the Chiefs selected linebacker Derrick Johnson with its first-round pick and also signed linebacker Kendrell Bell, Fujita asked for a trade and was sent to the Dallas Cowboys in exchange for a 2006 sixth round selection and a 2007 conditional selection. In three seasons he registered 326 tackles and 9 1/2 sacks. In the 2005 season, he played in 16 games and became the left outside linebacker starter for the last 8, after Al Singleton was placed on the injured reserve list. He recorded 58 tackles, 2 sacks and 2 forced fumbles. He was declared a free agent at the end of the season. On March 13, 2006, he signed with the New Orleans Saints, reuniting with former Dallas Cowboys offensive coordinator, now head coach Sean Payton. He was the first free agent to join the Saints when they returned to New Orleans after their year-long absence in the aftermath of Hurricane Katrina. Fujita was named defensive captain of the 2007 Saints. In Week 1 of the 2008 season, Fujita caught a crucial game-winning interception in the very end against the Tampa Bay Buccaneers. In the 2009 season, he earned a Super Bowl ring as a member of the Saints team that won Super Bowl XLIV on February 7, 2010, defeating the Indianapolis Colts 31-17 to win the team's first league championship. 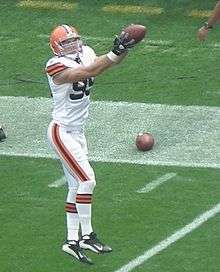 Fujita was a free agent after the 2009 season, and on March 7, 2010, he signed a contract worth $14 million over three years, including $8 million in guaranteed money with the Cleveland Browns, who coveted his leadership qualities. In September he was elected one of the Browns' defensive captains for the 2010 season. Through nine games, Fujita was second on the team in tackles and sacks, but he was injured in a November 14 game against the New York Jets and was expected to be out of action for an extended period. Fujita was suspended by the NFL for the first 3 games of the 2012 season because of his alleged participation in the Saints' bounty scandal. On September 7, his suspension was lifted. On October 9, 2012, four weeks and three days after an internal appeals panel vacated suspensions imposed on Fujita, Saints linebacker Jonathan Vilma, Saints defensive end Will Smith, and free-agent defensive end Anthony Hargrove, the league re-issued the discipline, with reductions to the suspensions of Fujita and Hargrove. Vilma's suspension remained a full season, and Smith's remained four games. Fujita's suspension was reduced from three games to one, and Hargrove's reduced from eight games to seven. After Week 6 against the New York Giants, Fujita was placed on injured reserve after injuring his neck, ending his season. Former commissioner Paul Tagliabue eventually exonerated Fujita of all culpability and wrongdoing in the Saints pay-for-play scandal, vacating his suspension and clearing his record. On April 22, 2013, Fujita signed a one-day contract with the New Orleans Saints while in Machu Picchu with his former teammate Steve Gleason, announcing his retirement immediately after. In August 2013, Fujita joined the new Fox Sports 1 sports network as an analyst on its Fox Football Daily program. Fujita is married with three children; he and his family have a home in Carmel Valley, California. He is politically liberal, and has gone on record as a supporter of women's rights and gay rights as well as an advocate for adoption, wetlands preservation, and other causes; he was named the Saints "Man of the Year" in 2009 for his charitable activities. ↑ "2004 Kansas City Chiefs Rosters and Depth Chart". p. 6. ↑ "Tackling adoption not issue for Fujita". The Dallas Morning News. 2005-12-17. ↑ Silver, Michael (2010-02-03). "Saints' Fujita defies stereotypes". Yahoo! Sports. Retrieved 2010-09-24. ↑ "A linebacker with a conscience". ESPN, Page 2 section. 2006-11-10. ↑ Youngmisuk, Ohm (February 6, 2010). "Raised Japanese, New Orleans Saints linebacker Scott Fujita's tale is the American dream". Daily News (New York). 1 2 Anderson, Mark C. (2009-09-23). "Fujita's Warrior Heart: New county resident Scott Fujita uses the game to attack everything from quarterbacks to social injustice". Monterey County Weekly. Retrieved 2010-09-24. ↑ Grossi, Tony (2010-03-07). "Cleveland Browns sign first two free agents, linebacker Scott Fujita and lineman Tony Pashos". The Plain Dealer. Retrieved 2010-09-24. ↑ Florjancic, Matt (2010-09-08). "Browns name 2010 captains". ClevelandBrowns.com. Retrieved 2010-09-24. ↑ Cabot, Mary Kay (2010-11-15). "Scott Fujita 'could be a little while' with knee injury, guard Billy Yates on IR: Browns Insider". The Plain Dealer. Retrieved 2010-11-17. ↑ "Saints player bounty suspensions overturned on appeal". NFL.com. Retrieved 2012-09-08. ↑ Brooks, Matt. "Report: NFL re-issues bounty suspensions for Saints players". The Washington Times. Retrieved 9 October 2012. ↑ "Season, maybe career, over for Browns' Fujita". Yahoo! Sports. 2012-10-24. Retrieved 2012-10-24. ↑ "Scott Fujita Stats". ESPN Internet Ventures. Retrieved 3 April 2014. ↑ Jeff Duncan, "Scott Fujita retires from NFL as a New Orleans Saint", Times-Picayune, April 22, 2013. ↑ Tim Baysinger, "Fox Sports 1 Sets Roster for Pair of Studio Shows", Broadcasting & Cable, August 12, 2013. ↑ Lapointe, Joe (2010-02-02). "The Saints Linebacker Who Speaks His Mind". The New York Times. ↑ Zirin, Dave (2010-03-18). "Why I Support the National Equality March": NFL's Scott Fujita Speaks Out for Gay Rights". Huffington Post.com. ↑ Withers, Tom (2010-08-25). "Browns LB Fujita wants to save Louisiana wetlands". AP in The Washington Post. Retrieved 2010-09-24.